Earlier in the week we saw Sharlto Copley provide the robotic motion-capture performance for the new movie Chappie and now we see the actor take on his latest gig, as the cop on the beat in a superhuman world filled with Powers. 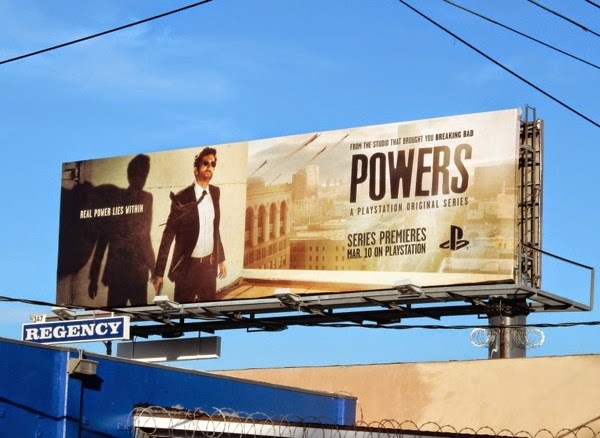 The award-winning comic book series by Brian Michael Bendis and Michael Avon Oeming finally receives its PlayStation Network debut after being much delayed with a few false starts. Set in a world of cops and capes, two homicide detectives 'Christian Walker' (Copley) and 'Deena Pilgrim' (Susan Heyward) work the mean streets in a world where humans and superheroes (and villains) exist, investigating super-powered crime. 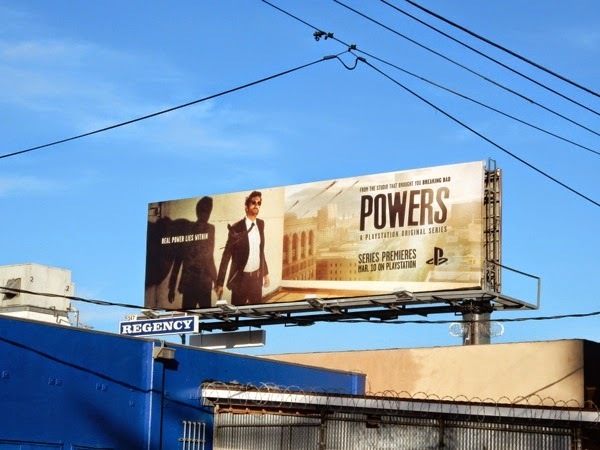 This cool billboard hinting at the superhuman strength within with the caped shadow, was snapped along Melrose Avenue on February 1, 2015. 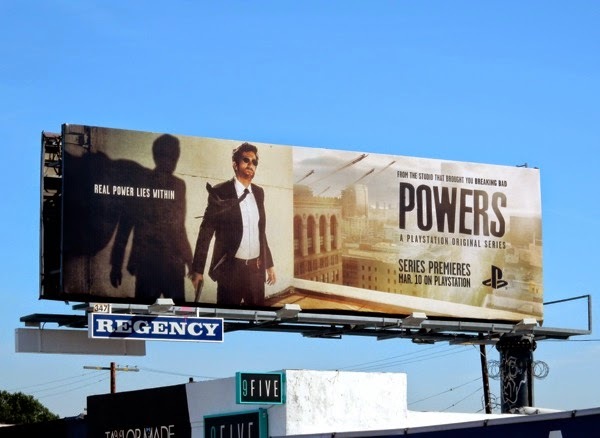 Let's hope PlayStation's first original scripted series, whose cast also includes Michelle Forbes and Eddie Izzard, can do justice to this acclaimed comic book. 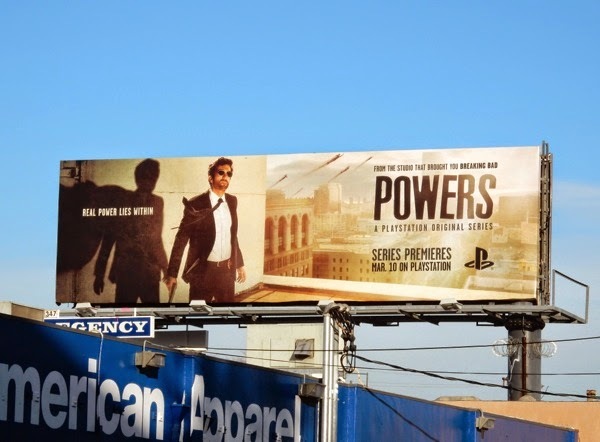 Plus check out all these other TV shows and movies inspired by comic books. Time to power up for the weekend. 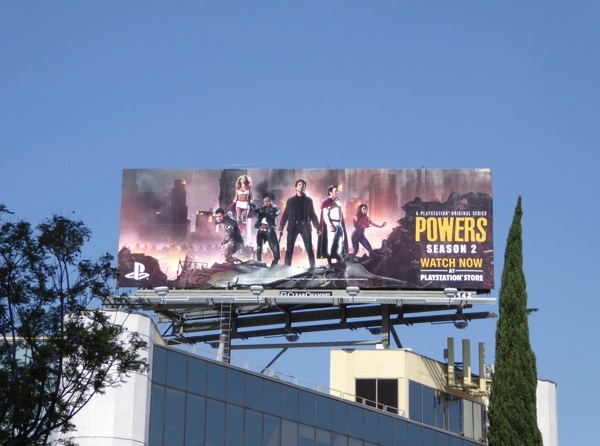 UPDATED: Here's another billboard for the new superhuman cop show spied high over Beverly Boulevard on February 8, 2015. 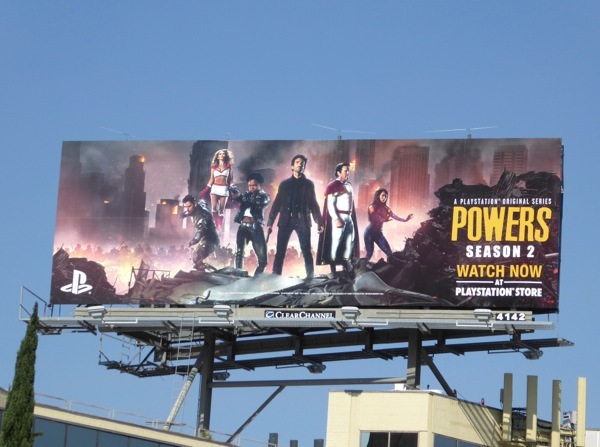 UPDATED: Here's also the second season billboard for the show, which really seems to be embracing its superheroic characters. 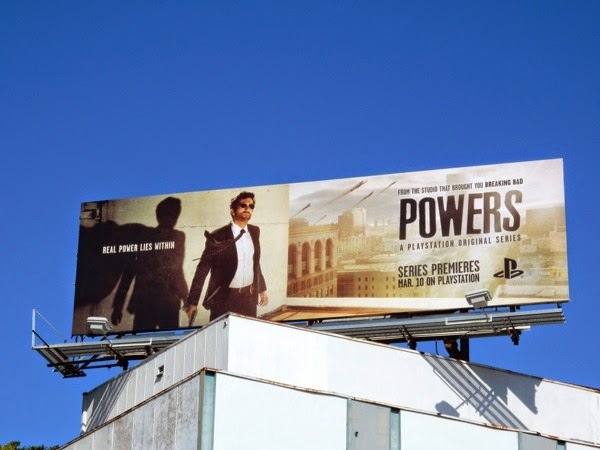 This sophomore season billboard was snapped flying high over Wilshire Boulevard at San Vicente Boulevard on June 16, 2016.